The London Borough of Tower Hamlets is home to a dense Muslim population, Stepney Green. Before 1980, local Muslims did not have a Masjid where they could come together for daily prayers or to run Islamic activities. Muslim residents would move from neighbour to neighbour’s home to pray in congregation, however as the number of worshippers grew, it soon became clear the need for a Mosque. In 1985, Stepney Shahjalal Masjid was formed on the grounds of Shandy Park. It was named after Hazrat Shah Jalal Mujarrad al Yemeni (RA) who migrated to Bangladesh from the Middle East to promote Islamic education and Dawah activities within the Sylhet region of Bangladesh. The Mosque is managed by a board of trustees, who are elected every two years by members of the Mosque. The activities and financial matters are regulated by the Charity Commission and Company law in UK. To support the running of the Mosque and its activities, there is an advisory board which comprises of Imams, Islamic scholars and community leaders. 4) To increase aware of Islam amongst non-Muslims, and to promote community cohesion to establish social harmony within groups. 1980 – Tarawih prayer and five daily prayer took place in various residents’ homes. 1981 – Stepney Shahjalal Mosque Committee was formed. 1985 – Prayer facilities moved into the caretaker hut on the grounds of Shandy Park, accommodating up to 50 worshippers. 1990 – Tower Hamlets Council grants permission to extend the facilities by installing portable cabins, allowing local children to attend Islamic education classes. Further extensions were built to accommodate the increasing number of worshippers. 1992 – The mosque was registered as a Place of Worship under Worship & Registration Act 1855. 1999 – Registered as a Charity with Charity Commission and a Company limited by guarantee with Companies House. 2002 – With the support of the local community, freehold land was purchased from Tower Hamlets Council for a purpose-built Stepney Shahjalal Mosque and Cultural Centre on the grounds of Shandy Park. 2005 - Additional portable buildings were added to accommodate approximately 800 worshippers inside the Mosque, however, about 500-700 additional worshippers still pray outside the Mosque in Park every Jummah and Ramadan in the rain, snow and in extreme cold and hot weather. 2010 - Full planning permission with conditions was granted to build a new Mosque and community facilities large enough to accommodate more than 3000 men, women and children. 2013 - All essential pre-conditions were approved and pre-commencement work began, however archaeological watching brief and Ministry of Justice permission were required for foundation design, due to the archaeological importance of Mosque land. The project was split into two phases; Phase one: Mosque and Phase two: Community Centre. A temporary Mosque was erected on the community centre site by installing portable building to accommodate 700-800 worshippers and to run Islamic education facilities for men, women, boys and girls. 2014 -2016 - Demolition of old Porta Cabin Mosque. Architect, Structural engineer, building control, Fire consultant, Health & safety Officer, Archaeologist and Quantity Surveyor hired. Foundation design was approved by Ministry of Justice (MOJ). 2016 – Tendering and appointment of Brook William contractor to build phase one – Masjid to accommodate approximately 1500 worshippers. Fund is needed 3.5 million pounds for this phase. Foundation stone laying ceremony took place on 7 November 2016 with participations local imams, community leaders, elders and youth. 2017 – Alhamdulillah, our appointed architect, structural engineer, M&E engineers, quantity surveyor and archaeology consultants have completed details drawings for tendering. The foundation design was approved by MOJ and archaeological watching briefs has now ended. It was a dream of the Muslim residents of St Dunstan ward and its adjacent area of London Borough of Tower Hamlets (LBTH) to see a purpose-built Mosque and Community hub since 1985. There are now no legal restrictions to build a Mosque on this site. 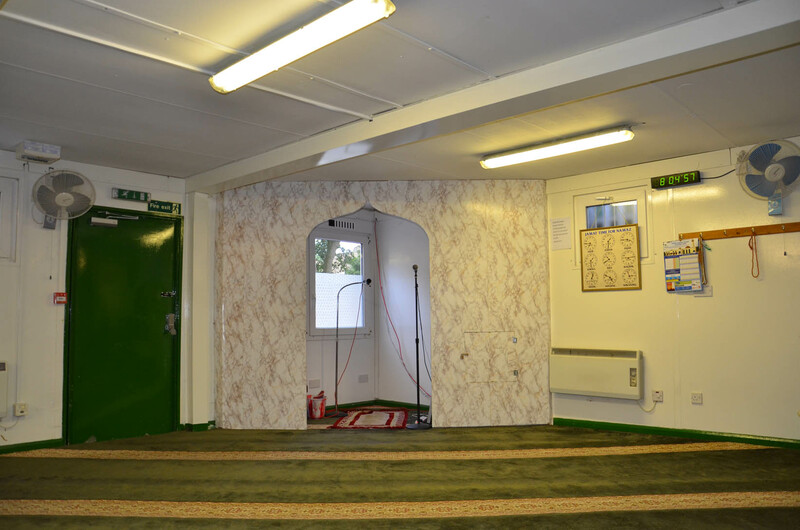 The aim is for construction to be finished within an 18-month period, and to remove the temporary mosque portacabin. Alhamdulillah, underground foundation work for this purpose-built mosque development work is nearly finished. More than 3000 men, women and children can pray together in the Mosque after completion of phase one and two of this Mosque and community centre. Brook William contractor was appointed for phase one of this project and estimated fund is needed for 3.5 million pounds to complete the phase one of this Mosque, but work began with a half million-pound in fund collected from donation of worshippers and others.